Linda Valines’ misfortunes started on Oct. 19, 2010. That’s the day the 52-year-old resident of Burlington, N.C., was in a car accident, which caused her to have a bulging disc in her back. She spent the next year going through physical therapy and, in January 2012, underwent surgery. A few months later, Valines was laid off from her position in a retail store, since she could no longer meet the physical demands of the job. She had worked at the store for more than 15 years. Her health insurance coverage also ended. “That was kind of devastating not to finish my treatment,” she said. Valines and her husband, David, considered adding her to his health insurance plan. However, doing so would cost the couple $100 per week, which they couldn’t afford. But things began to turn around for Valines in October of 2013, when enrollment began in the Affordable Care Act. She called the hotline number for the Health Insurance Marketplace a few times, but was unable to reach a representative for help. She then called the Charles Drew Community Health Center in Burlington, N.C., in December, and set up an appointment to discuss enrollment for health insurance. 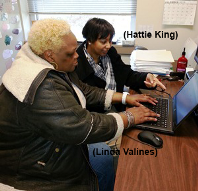 Valines regularly visits the Charles Drew Community Health Center, one of the seven community health centers operated by Piedmont Health Services, Inc., based in Carrboro, N.C. She has regular visits with Dr. Sionne George, her primary care provider, at the Charles Drew Community Health Center. Dr. George, her physician, and other staff members have helped her to better manage her back pain. Valines said. She is hopeful about the new year. She is now considering online college courses and hopes to find new opportunities.